This cabin is perfect for a family and has three separate sleeping areas. It has a bedroom on the main floor with queen bed. In addition, two twin beds are in a loft. There is also a full bed in another small bedroom in the same loft. This loft also has a den with TV. One bathroom on the main floor features a full tub and shower. For heat, you have a choice of a wood stove or heat pump (mini-split) or individual wall heaters throughout. Has AC for summertime use. Choice of two barbeques (large or small) as well as a fire pit. This cabin has a spiral staircase to get to loft so one must be able to negotiate this staircase if you want to access the extra beds and den with TV. This cabin is small and we recommend 4 adults and two children as the perfect fit to enjoy your stay. This cabin is small which makes it cozy. The living, dining and kitchen is one room and consists of a table with 4 chairs, a bench for two and a futon for two. We supply wi-fi and also set up a tailgater dish for TV as well as DVD and Bluetooth Speaker for cell phones. Nice appliances include electric stove, microwave, refrigerator, crock pot, coffeepot, toaster, dishwasher, iron, coffee bean grinder and washer and dryer. Adequate pots and pans and dishes, sheets and towels and a hair dryer are all for your use. This cabin sits high on a hill in a very nice and safe neighborhood not in any flood zones. While at the cabin can enjoy the outdoors by barbecuing on the covered porch as well as making smores at the firepit. 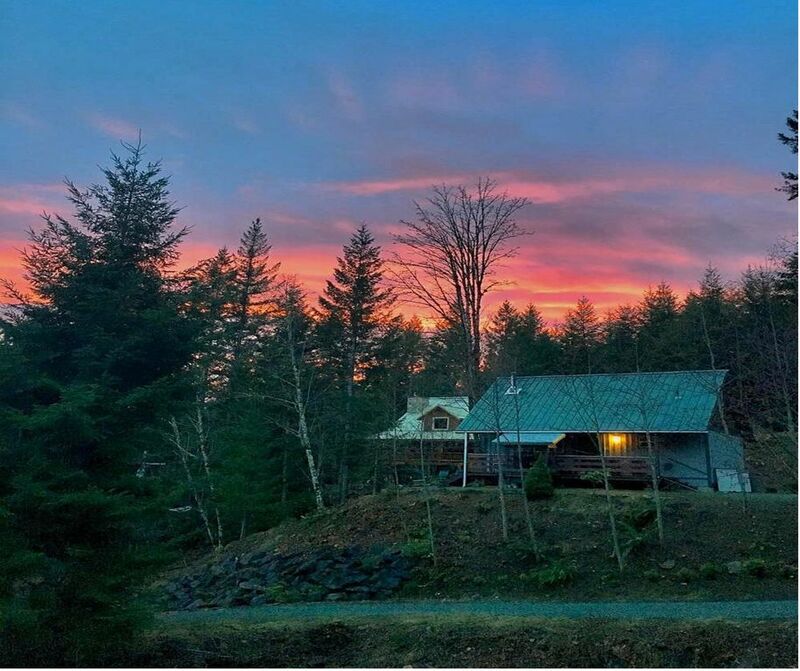 Recently retired in Packwood and purchased this cabin as an investment as well as a nice way to stay busy! This property is ideal for us to use as a rental. We live next door. We have been coming to enjoy Packwood since late 70s and finally retired here. This cabin is not in a flood zone. It sits on a hill with a nice view. It has a covered porch with a covered barbeque so it can be used all year around. This cabin also has air conditioning which most cabins in this area do not! There is fishing and hiking nearby. Or there are lots of elk to watch so one can just sit on the deck and relax! The cabin is located in a nice subdivision out of any flood zones (Skate Creek Terrace). In the event of of snow we recommend a 4 wheel drive as the driveway is steep. combined with kitchen and dining area and has love seat for two, table w 4 chairs and bench for two. Dining area is combined with living and kitchen and has 4 chairs, 1 bench for 2 and 1 love seat for two. This little cabin is simply the cutest. The owners have expertly appointment the space and were very helpful and attentive. We were so comfortable and had everything we needed for a weekend of skiing and family fun. We really enjoyed our stay at this cabin in Packwood. It was located in a quiet neighborhood and had all the amenities we needed. It was also close to town and a short drive to White Pass ski resort. We especially enjoyed sitting by the wood burning stove and taking in the view from the kitchen window! The cabin was very clean and the hosts were very attentive and accommodating. We would definitely stay here again! This was a perfect spot for our family of 5. The owners are very attentive and have put a lot of care into this property. Bedding and towels were abundant and luxurious. Wood stove inside and barbecue outside were well stocked with kindling/wood/charcoal/matches. Fridge well stocked with condiments (that was an unexpected plus!). Well maintained inside and beautiful outside. We had daily visits from elk. Our kids were enchanted by the loft upstairs which is well appointed with several beds, TVs, DVD players. The spiral staircase was fun for them as well! We visited during snow and cold weather and the cabin was warm and cozy throughout. We look forward to returning! Looks like it would be a ton of fun in the summer as well! I have no words to describe how amazin this trip was, the experience and expression of my kids face was priceless. They can't wait to be back. We are very happy your whole family enjoyed their stay and especially nice to hear the kids were entertained! You are very welcome to come back anytime! Packwood is the best area to stay if wanting to visit both Mt Rainier and Mt St Helens. Also is 22 miles from White Pass for Skiing and all other winter sports. Packwood is 7 miles from Entrance to Mount Rainier National Park. Just outside of Packwod is are numerous hiking trails to lakes or streams with views of the Cascade mountain range along the way. This cabin is located in a very safe, nice and quiet subdivision high above any flood zones.